Sometimes steps provided in How to Clear Cookies article are not helpful. In such cases instructions below will clear cookies and other junk files for sure. Step 1: Clear cookies as described in How to Clear Cookies article. Step 2: Download and install “Crap cleaner”. It works with Windows 7 and Windows 8 and 99% it should work with Windows 10. Please be aware as this is free software, installer will advise you to install ‘IObit toolbar’, but it’s up to you what to do with it. Note: after installation you’ll get “Advanced System Restore” program even though initially you’ve visited ‘Crap cleaner’ download page. Step 3: Run “Advanced System Restore” and on “Start Page” select “Junk Files Clean”, then click “Scan” and finally “Repair” button. 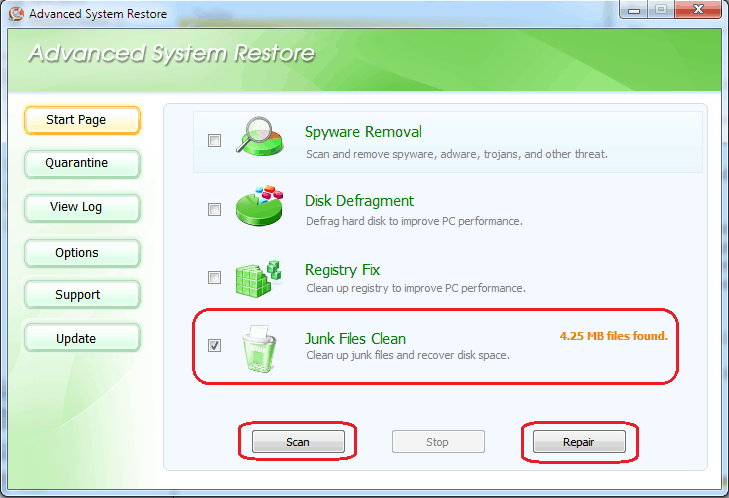 As shown on screenshot “Advanced System Restore” found 4.25mb of junk files.